Chrome plated finish. Open wire construction permits greater air circulation, which helps reduce moisture and dust buildup. Swivel stem casters with bumpers. Two push handles. Wire basket shelf is 18" x 36" x 4 1/4". 36 1/2" overall cart height. 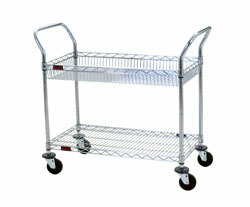 WBC1836C-1B1W 1 chrome basket shelf, 1 chrome standard shelf - utility carts with basket shelves. WBC1836C-2B Two chrome basket shelves - utility cart with basket shelves.